Africa Aerospace and Defence (AAD 2012), Africa's largest exhibition of air, sea and land capabilities, returned to AFB Waterkloof after extensive renovations and upgrades at the base. The exhibition was previously held at AFB Ysterplaat in Cape Town in 2006, 2008 and 2010. 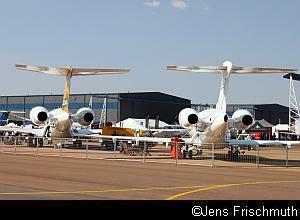 Various manufacturers focused on the outstanding requirements for the South African Air Force. A need to replace the C-47TP aircraft has resulted in a requirement for a maritime surveillance platform and the Hercules fleet is also in need of replacements. 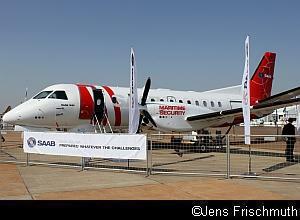 Thus, aircraft like the Alenia C-27J, Boeing C-17 Globemaster and Lockheed Martin C130-J made their appearances again (as at AAD 2010) and the SAAB 340 Maritime Security Aircraft was seen at AAD for the first time. The C-27J performed various demonstration flights during the trade days. Whereas the trade days are only open to trade visitors, AFB Waterkloof welcomed the public on the 22nd and 23rd September, when a wide range of aerial and land-based displays took place. A total of 92 982 visitors were present during these days. As always, the SAAF took centre stage during the airshow days, demonstrating its professionalism and capabilities both in the air and on the ground. 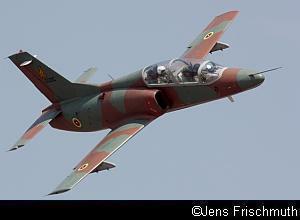 Sadly, the USAF did not participate in the airshow and the only international participation was by a Zimbabwean K-8 jet trainer. On the Saturday morning, there were thunderstorms in the area and the spectators that arrived early had to endure the odd rain shower. Luckily, the weather started to clear soon and remained good for the rest of the weekend. Both days started off with a parade, which consisted of the emergency vehicles, various SANDF vehicles and a SAAF Oryx and Rooivalk helicopter. 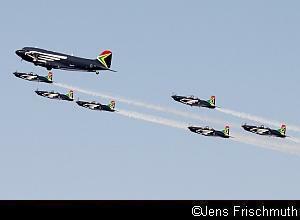 This was accompanied by a skydive by the SAAF's Golden Eagles. Rooivalk appeared at AAD for the first time as a fully operational combat helicopter. Although the machine had been in limited service for some time, it was not until April 2011 that the type gained its full operational certification, with an initial fleet of 5 Block 1F machines in the deployment baseline configuration. Earlier this month, Denel redelivered two similarly upgraded aircraft to bring No 16 Squadron's fleet up to 10. 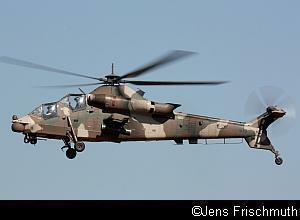 Just one more Rooivalk is to be delivered, having been retained for trials by Denel. 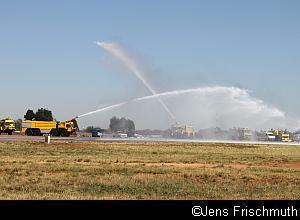 Two Rooivalk helicopter flew in an impressive display at AAD, showing the manoeuvrability of this machine. Further helicopter action was provided by a similar BK 117 display. The SAAB Gripen, operated by No 2 Squadron, naturally took centre stage. The solo displays were flown by Lt. Col. "Blokkies" Joubert. Two solo performances were done during each of the public days and ended with the dispensing of flares. The most impressive displays, however, were his sunset displays flown during the trade days. The few who stayed behind until it was almost dark witnessed something special. In the low evening light, the afterburners are visible throughout most of the display. When Gripen took part in the 2-vs-1 air capability demonstrations and the formation flypasts, the flying duties were shared by various other pilots from No 2 Squadron. The last four of the 28 Gripen ordered were due to arrive in South Africa shortly, thus completing the delivery process. 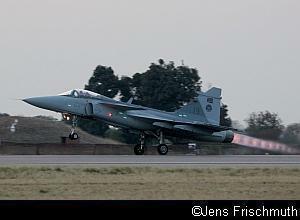 These four aircraft had officially been handed over to the SAAF earlier this year, but were held back in Sweden, primarily to take part in the Lion Effort exercise, which brought together Gripen aircraft from four of the user nations for joint military operations. Gripen and Rooivalk may form the sharp end of the air force, but there were many other SAAF aircraft and capabilities on display. 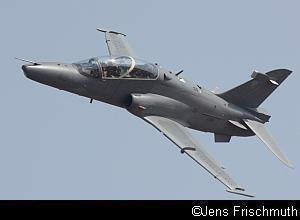 The Hawk advanced trainer/ light fighter flew frequently during the week. This aircraft is due to be integrated with Denel's A-Darter missile that is being developed with Brazil, giving the Hawk an important air-to-air capability. An undoubted highlight on both days was the staging of a mini-war. Before the ground action commenced, the SAAF demonstrated its fighter capabilities by staging a simulated 2-vs-1 dogfight between two Gripen fighters and a Hawk jet trainer. The main action included a supply drop by a Casa 212, a C-130 Hercules deploying troops, Oryx helicopters delivering troops and small vehicles to the battlefield and even the SAAF Museum's Alouette III participated, as did a BK 117. 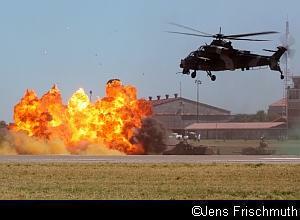 Air cover was provided by a Rooivalk attack helicopter and a Hawk was used for ground attacks. Ground troops utilised the Olifant tank, Ratel and Rooikat to fight the "enemy". The pyrotechnics were impressive and there were many loud explosions to accompany the action. 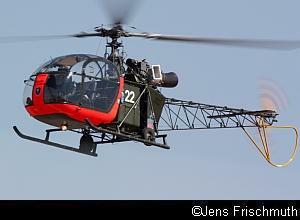 The South African Air Force Museum, based at AFB Swartkop, displayed its Alouette II, Alouette III and Puma helicopters. AFB Swartkop is only about 6 kilometres from AFB Waterkloof. This enabled other display teams like the Goodyear Eagles and Gabriel Wings Aerobatic Teams to base themselves at AFB Swartkop as well to minimise the aircraft movements at AFB Waterkloof and thus speed up the programme. 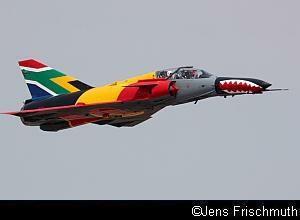 The ex- SAAF Impala, privately owned by Dawid Laas and a regular at South African airshows, was flown by its usual display pilot, Mike Weingartz. The appearance of a Cheetah is always a highlight at any South African airshow. The Cheetahs were withdrawn from service in 2008 and 12 were subsequently sold to Ecuador. A few are still operated by Denel Aviation and the Cheetah D displayed at AAD 2012 was flown by Denel's Chief Test Pilot Ivan Pentz. The dual Vampire display was another highlight of the event. The SAAF Museum Vampire was flown by Col. Rama Iyer and the other Vampire, which is privately owned by Richard Smit, was flown by Col. Glen Warden. On the Sunday, the outgoing Chief of the South African Air Force, Lt. Gen Carlo Gagiano, flew in the Museum Vampire alongside Col. Rama Iyer. After its display, his plane stopped in front of the crowd line. There, Lt. Gen. Gagiano was met by his wife and given a salute which included a giant wall of fire in his honour. AAD 21012 was Lt. Gen. Gagiano's last major event as the Chief of the SAAF and he is due to hand over power to Lt. Gen. "Zakes" Msimang at the end of the month. A North American P-51 Mustang was seen at AAD for the first time since 2000. 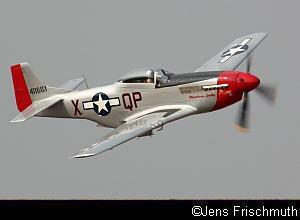 "Mustang Sally", as it is affectionately known, is owned and flown by Menno Parsons. Other ex-military aircraft displayed were a privately-owned Aero L-29 and the Flying Lions, flying the ever popular North American Harvards, were present as well. Other aerobatic displays included the following: The Goodyear Eagles Team, in their Pitts Specials was comprised of Glen Warden, Neil Trollip and Nigel Hopkins. Nigel also flew his high impact routine in his MX-2. Chris Briers displayed the PAC 750 and Johnie Smith flew his Slick 360. The Gabriel Pitts Display Team was there as well and a paraglide display took place each day too. 1 Time Airlines thrilled the spectators with a display of one of its MD-87 jet airliners on Saturday. Not to be outdone, South African Airways sent an A340 on both days. Two different aircraft were used. The one that flew on Saturday was painted in the special Olympic colour scheme and the one on Sunday was in the standard SAA colours. 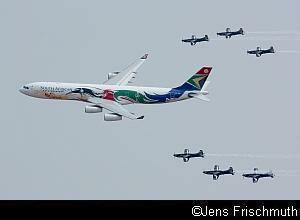 The A340s flew a formation display with the Silver Falcons and then did a solo display each. The Silver Falcons had a special surprise in stall for everyone. One of the SAAF C-47TPs had been painted in the colours of the Silver Falcons before the event and the colour scheme was officially unveiled at AFB Swartkop just before AAD. Naturally, a Silver Falcons display with the C-47TP was a must for AAD2012 and was one of the highlights of the event. Team 73, consisting of Maj. Roy Sproul, Maj. Werner Vermaak, Lt. Jacques Poolman , Maj. Heybrech van Niekerk and Maj. Beau Skarda, also performed two polished displays each day and showed everyone the pilot talent that is in the South African Air Force. The Police Special Task Force demonstrated their readiness by staging a simulated anti-hijacking operation. 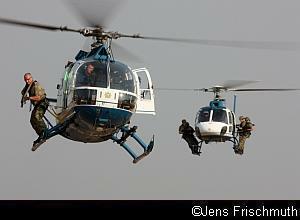 The demonstration included the use of a Squirrel AS350 and a MBB BO-105 helicopter for the rapid deployment of the members of the SAPS Special Task Force. Both airshow days ended with two very impressive jet formations. 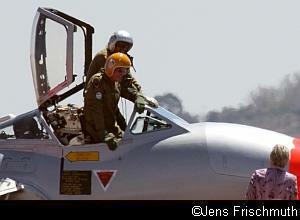 Many of the jets that had entertained the trade and public visitors throughout the whole of AAD 2012 teamed up for a special finale. The first formation consisted of the L-29, the two Vampires and the Impala. 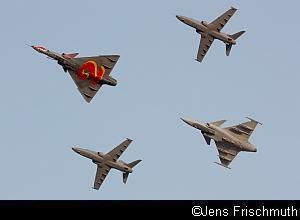 The second formation was made up of the Cheetah, two Hawks and the Gripen. This was a truly fitting finale to two entertaining and thankfully safe days of flying displays. Below, the events from AAD 2012 are captured in 3 photo galleries comprising over 400 photos.